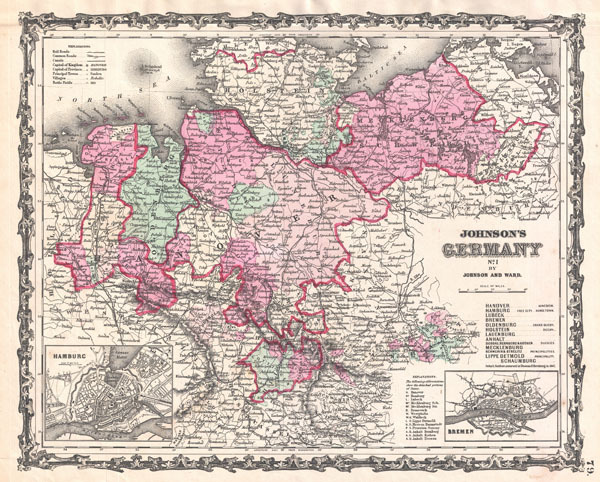 A very beautiful example of the northern sheet from Johnson's Germany series. Details Hanover, Mecklenburg Schwerin, Holstein and Oldenburg. Insets detail the city of Hamburg and the city of Bremen. Color coded according district. Shows railways, lakes, rivers and towns. Features the strapwork style border common to Johnson's atlas work from 1860 to 1863. Published by A. J. Johnson and Ward as plate number 79 in the 1862 edition of Johnson's New Illustrated Family Atlas. This is the first edition of the Family Atlas to bear the Johnson and Ward imprint.